This range of sounders has been specially designed for use in demanding industrial and marine environments where a robust construction and high ingress protection rating is required. 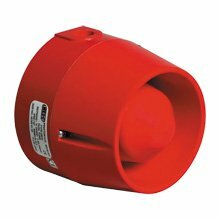 Cooper MEDC can also provide a range of sounders suitable for use in potentially explosive atmospheres. For more information, refer to the datasheet or contact Cooper MEDC sales. voltages 12V & 24V d.c. 115V & 230V a.c.
Operating temperature -55ºC to +70ºC. Any two tones may be switched by the external voltage supply (d.c. version). Retained 316L stainless steel cover screws. Available compliant to ANFOR NF S 32 001.